A representative of the so-called School of Munich (the Greek artists who studied in the Bavarian capital in the 19th century), he has always been regarded as ‘the painter of childhood’ due to his predilection for themes inspired by the life of children. Genre and outdoor scenes are also part of his repertory, which shifted towards portraiture and still-life painting after his return to Greece. Mother’s Affection in the A. G. Leventis Foundation Collection exemplifies Iakovidis’ favourite subject matter ¬¬– moments of affection shared by the young protagonists with mother, grandfather or grandmother. Several versions of this subject, which was first painted by Iakovidis in 1889, are known. 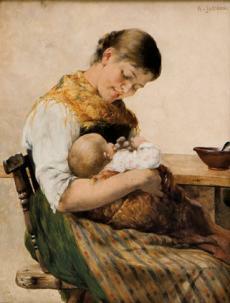 It depicts a young mother feeding her baby in her arms. The setting is not specific, as the background remains neutral, and there are scarcely any objects. A mother’s love and affection are eloquently captured in the expression of the woman’s face, which glows upon looking at the child in her arms, in an image that encapsulates the very notion of motherhood. Contained forms, earthy hues, a warm tonality and diffuse, warm light enhance the mildness and serenity conveyed by the composition. In addition to genre scenes, the artist was also interested in portraiture and still-life painting, especially during his mature years. 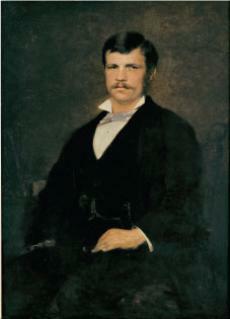 The Portrait of Nikolaos Karagiannis, painted in 1882 while Iavovidis was studying in Munich, depicts a lawyer and is a characteristic example of a bourgeois portrait in a rather formal pose and a dark palette. He studied at the School of Arts in Athens (1870-1876) and the Munich Academy (1877-1883). He participated in and received awards at exhibitions in the Kunstverein and Glaspalast, and in 1884 became a regular member of the Künstlergenossenschaft. In 1900, invited by the government of Greece, he returned to Greece as the first director of the newly established National Gallery, a position he held until 1918. In 1904he was appointed professor of painting at the Athens School of Fine Arts, where he taught until 1930, also acting as the school’s directorfrom 1910. He received the Greek Award for Excellence in the Arts and Letters (1914) and became a member of the Academy of Athens (1926).A representative of the School of Munich, he is always called ‘the painter of childhood’ due to his predilection for subject matter related to the life ofchildren. 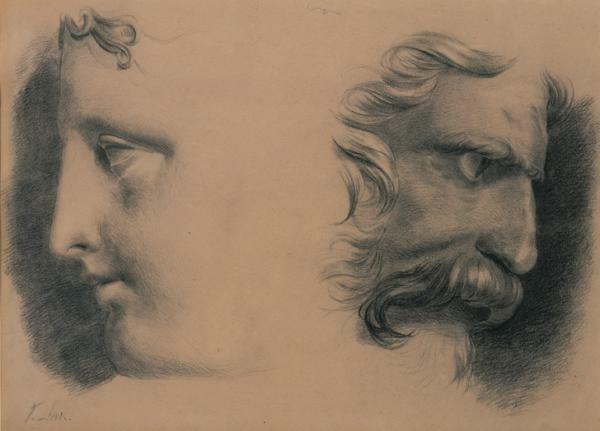 Genre and outdoor scenes are also part of his repertory, which shifted towards portraiture and still-life painting after his return to Greece.